With all the murder investigations Nicole Fitzhenry-Dawes has been involved in since leaving her career as a criminal defense attorney, she’s looking forward to a short vacation back to her hometown of Washington, DC. The trip turns out to be anything but restful. Her dog-sitter keeps calling with problems, her parents are up to some scheme that Nicole is sure she won’t like, and someone is sending her best friend messages that are both threatening and intimate. He knows things no stranger could possibly know. With her best friend’s life on the line, the stakes for Nicole have never been higher. Can she put all the clues together in time? Or will the case that matters the most to her be the one she’s finally unable to solve? 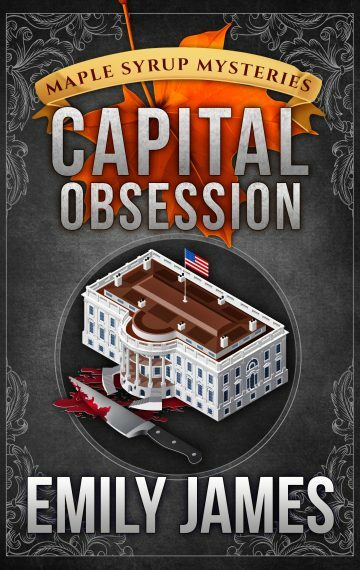 Capital Obsession is the sixth book in Emily James’ Maple Syrup Mysteries. The series is full of small-town settings, quirky characters, and a touch of romance!